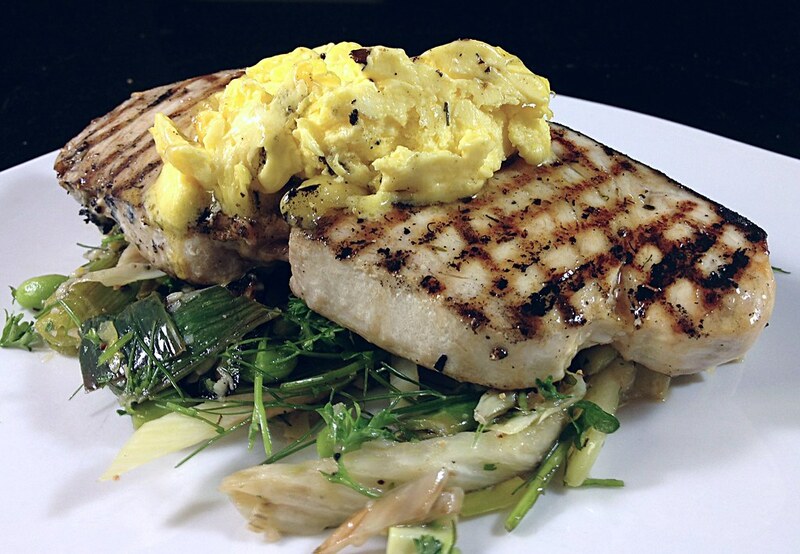 This week, we will be featuring grilled swordfish on our list of seafood selections. Served with your choice of maple glazed carrots or our steamed fresh mixed vegetables, this mild flavored fish is brought together quite well with an avocado lime butter. Swordfish is a firm, succulent and meaty fish whose texture can be compared to that of tuna. As you know, the swordfish gets its name from its elongated and pointed tipped nose that closely resembles a sword. Only found in the warmer, tropical waters of the Pacific and Atlantic Gulf Coast and Indian Oceans, this fish can grow to upwards of 15 feet and almost 1,400 pounds. Swordfish are known to be vigorous and powerful fighters. They have been harvested not only for food but also sport since ancient times. When hooked or harpooned, they have been known to dive so quickly, they have impaled their swords into the ocean bottom up to their eyes. Grilling or skewering is the most common form of cooking this fish. When it comes to your health, although considered an oily fish, it is a heart-healthy choice because of its omega-3 fats. Swordfish does contain a significant amount of fat, but the majority of that fat consists of heart-healthy mono- and polyunsaturated fats. These fats aid in lowering cholesterol and the risk of coronary artery disease. Swordfish is also among the few natural food sources of vitamin D and is low in sodium and potassium both of which help control blood pressure. Not only is this dish good for your health, but it also tastes great too! Make your meal complete with a glass of chardonnay... it pairs quite well with the dish's mildly sweet taste!